Today’s reading may be interpreted as yet another healing miracle of our Lord that showcases his compassion for those who are marginalized in society. The worst part about being a leper during Jesus’ time, after all, was not so much the physical affliction as much as the social isolation inflicted on lepers. Terrified of possible infection, Jewish authorities made sure lepers lived far away from society and rang a bell to warn people of their approach. Moreover, the lepers were condemned as sinners or children of sinners because such an affliction was believed to be the effect of either one’s sins or the sins of one’s parents. One can only imagine how desperate this leper must have felt when he meets Jesus. Finally, no more ugly sores. Finally, no more frightened or even disgusted glances from others. Finally, no more children scampering away. What is most striking about this leper is the unexpected courtesy that he extends to the Lord. His need for a cure does not make him demand it. By no means does his desperation make him believe that the help he asks for is not a right that he is entitled to collect. Rather, it a gift that will be given him only if Jesus wishes. Such a courtesy must have moved the Lord to grant him his wish. For as Scripture tells us, the Lord can never resist a humble heart. But the Lord grants him another gift. 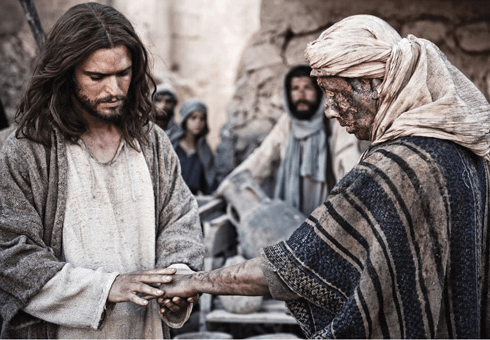 He doesn’t just pronounce the words that heal; Jesus stretches out his hand and touches the leper. He does this not in order to show everyone watching that he is not afraid of catching leprosy, but in order to return the courtesy to a man who has probably been untouched—and has been hungry for touch—for a long time. The lepers in the Gospel always have something to teach us. We recall the one leper who, by returning to Jesus to thank him, teaches us about gratitude. This one teaches us about grace. It is not a right we can demand because we deserve it. Rather, it is a gift we can only request because like every true gift, it is given only if the Lord wishes to give it.